As a lifelong dog lover, I was absolutely delighted, and then deeply moved, to read this article by anthropologist Scott Simon in American Anthropologist: Real People, Real Dogs, and Pigs for the Ancestors: The Moral Universe of "Domestication" in Indigenous Taiwan (Nov 2015) (link). Like Amazonian hunter-gatherers (Kohn 2007), Seejiq describe dogs as sentient and intentional beings with whom humans can communicate. They know the names of dogs, identify their companion humans, and relate stories about their hunting exploits. They observe that dogs exhibit individual preferences in selecting friends or mates. 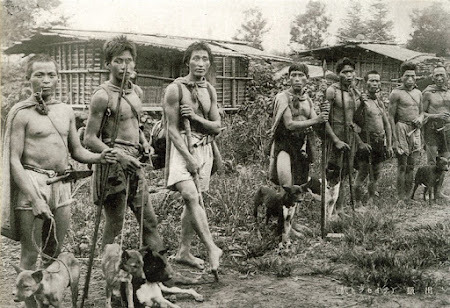 Gaya demands hunters to be modest about their own abilities, yet they brag about the abilities of their dogs. When people eat outside, perhaps around a fire on winter evenings (Figure 4), they allow dogs to approach and eat with them. This relationship has not changed much since the Japanese colonial period, when ethnographers expressed surprise about sharing tables and even bowls with dogs. Kim (1980:189), three decades later, likewise considered sharing a table with dogs to be among the “unpleasant experiences” of fieldwork. Yet excess sentimentality attached to dogs is not appreciated. Contrary to Yi-Fu Tuan’s definition of pets that includes bringing them into the house (Mullin 2007:293), the norm is to keep dogs outside. It is considered cruel to tie up dogs, even if many people still feel the need to do so. The Seejiq affirm sovereignty when they say that their Gaya is efficacious, even better than state law, in managing multispecies relations. In one story, a police officer stopped an elderly Seejiq hunter, confiscated the serow (a mountain goat) he had caught, and took it home to eat. A few days later, the brakes on his brand-new motorcycle failed and he careened off a cliff to his death, an unlikely accident that people explained by saying Seejiq ancestors had punished him. Indigenous people everywhere seem to delight in revealing differences in the way they relate to animals as compared to the dominant groups. These conversations are prompted by conflicts over both material and abstract issues, such as hunting regulations and sovereignty, but also by relatively mundane conflicts, such as garbage collectors poisoning dogs. When indigenous people talk with anthropologists about cultivating trust with prey animals or affirm ontological difference in their relationships to animals, they assert moral superiority over colonial and postcolonial power. For peoples whose life projects are endangered by outside forces, calling attention to different ways of relating to animals is a means of positioning themselves as sovereign peoples. Track down a copy of this paper. Well worth reading for the lovely prose, the beautiful stories it tells, and the deep insights it offers. The final paragraph hits like a sledgehammer.